Seller Strategies: Should You Launch Your Product With Amazon PPC? Welcome to episode one of Seller Strategies! In this episode, Maria and Ervin share the tips and tricks that helped them become successful Amazon FBA sellers. How Maria lost $700, but learned a valuable lesson. Should you launch your product with Amazon PPC? The importance of product reviews and keyword relevancy. If you’ve missed an episode, you can watch all of them on YouTube. When people first start out, almost everyone makes a mistake or two. Even successful Amazon sellers get tripped up. But Maria knows firsthand that mistakes are a blessing in disguise. She lost $700 on one of her first product launch, yet the valuable lesson she learned was worth so much more! As Maria was getting ready to launch her product on Amazon, she read that you had to start running Amazon Pay Per Click (PPC) as soon as your listing became active. There seemed to be a consensus online; PPC was just one of those things you had to do if you were wanted to sell on Amazon. So she did just that. She began running PPC ads as soon as her product’s listing was activated. When she checked her PPC reports, she could see that customers were viewing her listing. Shoppers typed what they wanted into Amazon’s search bar and, when they matched the keywords in her PPC campaign, they would see her ad at the top of the search results. Many clicked on the ad and were taken to her listing. It was perfect. 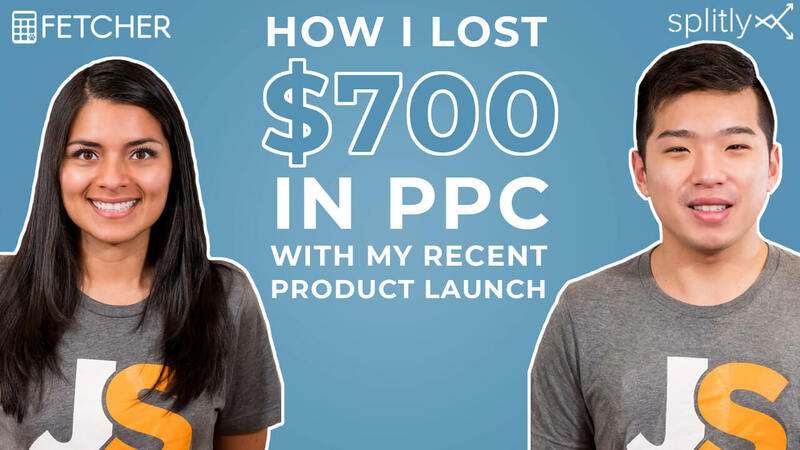 PPC was working…at least in terms of driving traffic to her product. But that traffic? It wasn’t converting. Buyers weren’t buying, and the reason for that was simple. Customers, when they got to her listing, saw ‘zero’ reviews. Ultimately, the lack of reviews made them uncertain about the quality of the product. And when a shopper is unsure of the caliber of a product, and there is no third-party feedback available for the item, more often than not they will not buy. Then how can you get the reviews you need? There are lots of ways to generate reviews, but some of the newest and most effective ways to get that coveted feedback are outlined in our Seller Expert Tips blog. From Facebook chatbots to influencer marketing, and Instagram sales channels to building a Shopify store, each strategy can increase traffic to your Amazon listing. And with increased traffic comes an increase in your chances of making sales and getting reviews. So while some of the ideas in the blog will require money, more often than not the return justifies the investment. Then, when you have those reviews, your PPC campaign’s views should start converting into sales. If you have no reviews, though, should you run PPC? When you first launch your product, Amazon doesn’t really know what your product’s all about. For that reason, it’s crucial that PPC is turned on immediately, from day one. In order for your item to populate Amazon’s keyword search results, the platform needs to understand how your product relates to its customers’ searches. And the quickest way for Amazon’s algorithms to learn about your item is through a PPC campaign. Each time a shopper’s search matches the keywords in your PPC campaign, Amazon learns more about your product and it becomes more relevant to those keywords. It teaches the software to show your listing to the right people, the ones who are more likely to buy because your product is what they said they wanted. How does Amazon determine keyword relevancy? Frankly, we’re not sure how Amazon determines relevancy. No one but Amazon truly knows how relevancy works. But, there’s a pretty good chance that Amazon has an internal scoring system where they take into account a product’s click-through and buy-through rates. If your PPC ad leads to a lot of shoppers to click on and view your listing, it likely increases your item’s relevancy to the keywords searched. And if the click-through then leads to a sale, it’s likely that the conversion will increase your product’s relevancy even more. This is another reason why you want PPC turned on away. The higher your click-through and buy-through rates, the more likely it is that Amazon will deem your product relevant to your listing’s keywords. Should you launch your product with Amazon PPC? Some say yes. Others say no. At the end of the day, though, there’s no perfect launch strategy. What it comes down to is your tolerance for risk, and your PPC budget. Well, that’s it for today! Tune in next week , to learn more tips and tricks to help you succeed as an Amazon FBA seller.